Confederation Square is a triangular plaza wedged between Wellington Street and Elgin Street right in front of Parliament Hill. 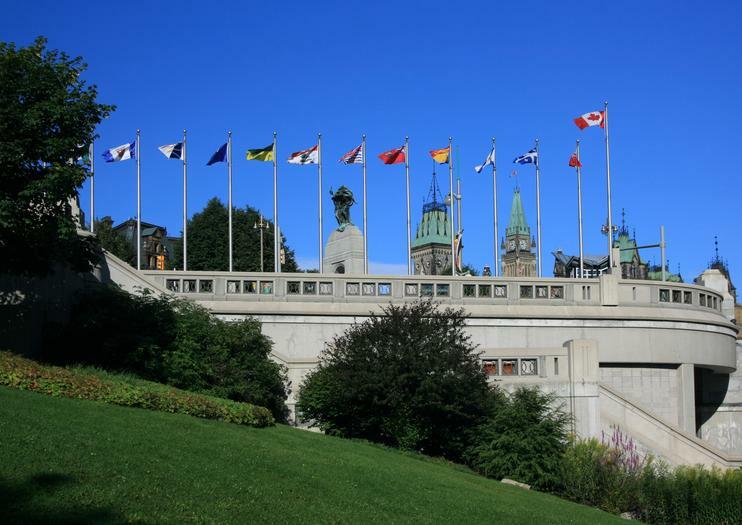 It is a planned urban space that was, together with the National War Memorial, officially completed around 1939. The big granite memorial sits at the very center of the square and was originally a tribute to the Canadians who fought in World War One, but has since become more of a symbol of all Canadians serving the country in times of war. Bronze soldiers, including infantry, nurses, dispatch riders and many more regiments and corps portray “The Response” under the big granite arch, the heroic sacrifices made by Canada. They are watched over by two figures representing peace and freedom mounted on the top of the arch. Located at Confederation Square and right in front of the National War Memorial is also the Tomb of the Unknown Soldier, a second monument that holds the remains of an unidentified soldier fallen during the First World War in France. The remains of the soldier were set to rest with full military honors and the tomb in form of a sarcophagus is in turn intended to honor the 116,000 Canadians who died or will die in past, present and even future conflicts. The square has become an important ceremonial center in Ottawa and was eventually named a National Historic Site of Canada. Confederation Square is located in the center of Ottawa, just a bit to the west of Parliament Hill. It’s easy to get there with one of the public busses, as a number of them make a stop in the area. The closest stations are Elgis/Queen serviced by bus numbers 4 and 14 as well as Wellington/Metcalfe, where bus numbers 1, 2, 7, 9 and 12 make a stop.